Our time in NYC has been a rollercoaster. As many of you know Brendan and I booked a one-way ticket to NY in December to dedicate 2017 to chasing our dreams in the big apple. We were lucky enough to live with family until we could get our feet on the ground, but we quickly realized how expensive, cutthroat, and difficult it is to make it here. After about 7 months of hustling, and tons of prayers we were both given unbelievable opportunities. I was signed by Wilhelmina in NY & LA, and shortly after Brendan was offered an incredible position with an International Software company on Wall Street. We were finally able to search for an apartment of our own! We found our dream place, with loads of amenities in an incredible neighboorhood and decided to move in a week before Bren started his job. After signing our lease it dawned on me that we had zero furniture and move-in was 7 days away. My priority was finding a bed, Brendan’s on the other hand was to have a giant TV and a comfy couch because football season is quickly approaching…which means Saturday and Sunday for the next 16 weeks will be spent snuggled up on the couch. Girlfriends/wives of football fanatics you’ll understand. Every couch we saw was either too small, too big, too uncomfortable, or too expensive. Also, moving in the city is a nightmare, and dealing with delivery was giving me a headache. I started searching for a solution online when I stumbled across my beloved Burrow. I was fascinated by their concept, and intrigued that I would be able to assemble this bad boy all by myself. I could pick the color I wanted, how many seats we needed, and even how we wanted our arms to look. I was nervous to order furniture that I hadn’t yet sat on, but decided to trust the reviews and go for it. Our walls are all white, so I figured a Navy Blue couch would be a nice pop of color for our place. 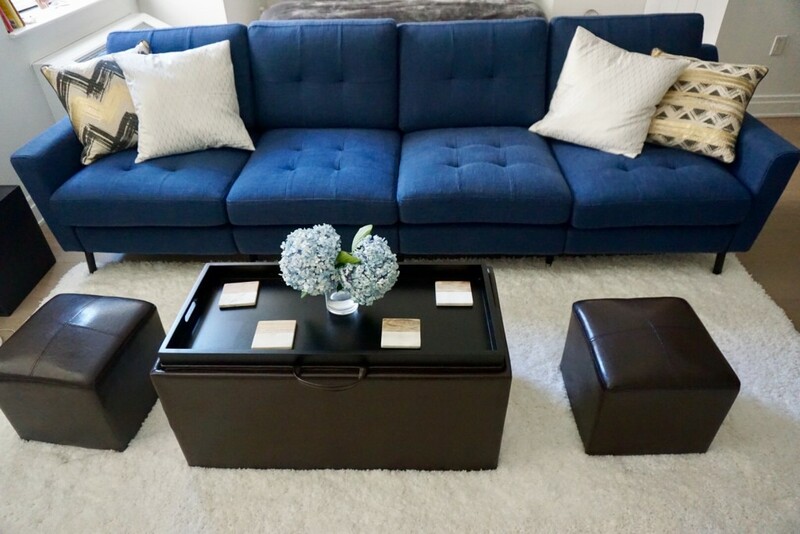 We followed a step-by-step video to assemble our couch, and within 30 minutes we had a giant blue beauty as the focal point of our place. After a long day of moving we crashed on the couch with our celebratory bottle of wine, and were SO pleasantly surprised by how comfortable our couch was. It’s made of high quality material, and has a super modern/cool look to it. The length is amazing, I’m 5’9 and able to lay down and Bren still has a cushion all to himself. Now my project has been to find other furnishings to compliment our Burrow. Brendan wanted to find red and white accents so that we would have Patriot colors…and top it off with a signed Brady Jersey on the living room wall lol sorry babe, not happening. I am SO thankful that I found Burrow when I did. They have the best prices BY FAR, and are revolutionizing the way we shop for couches. I highly recommend them, especially if you’re living in a city because it’s so simple, and stress free. Use my referral code COZY115 for $50 off a Burrow of your own. Whether you’re looking to purchase a chair, love seat, or sofa, you won’t be disappointed! H&M HOME STORE!?! Why have I never heard of this?